Spanish classes, cultural events, ziplining, paddle boarding and baby alligators are just some of the few reasons why Puerto Vallarta continues to be one of Mexico’s top family destinations. Summer time is the low season for Puerto Vallarta and provides for a fairly secluded destination for families to play together. The city’s Downtown, which maintains its small-town spirit alive makes it the perfect playground for family members who want to take a bike ride around town or take a cooking class, while the many hotel kids clubs provide a controlled environment where children can be entertained. For those looking for a summer family getaway, the Puerto Vallarta Tourism Board has worked a number of deals with their partners to provide the best deals to visit the destination, these can be found on Visit Puerto Vallarta. While on the site, visit the "Win a Trip" section to register for a chance to win a 6-night trip to Puerto Vallarta, including air and a 3-night stay in one of Puerto Vallarta’s 4 + star properties and 3-night in a boutique property in the destination’s Downtown. Stays include nights in Hotel El Pescador, Los Arcos, Melia Puerto Vallarta All-Inclusive, Plaza Pelicanos Grand, Hotel Rosita, The Westin Resort & Spa Puerto Vallarta, Hotel San Marino and Velas Vallarta which recently won top honors at TripAdvisor's Family Vacation Critic Favorite Hotels Awards. Following is the Puerto Vallarta Tourism Board’s top activities for families to enjoy while in Puerto Vallarta. A Day in a Traditional Mexican Ranch: An educational experience for the entire family, learning about life in a traditional Mexican ranch will make for a memorable vacation. The small town environment allows for interacting with the locals as well as an immersion into their local customs and traditions. Some ranches also offer tours on horseback, by motorbike or hikes through surrounding ecosystems. Guests also have a chance to savor some of the Mexican delicacies prepared at the ranch where meals are often cooked in traditional Mexican kitchens. Canopy Tours: A favorite with both parents and children, canopy tours are an exciting way to see and learn about the varied tropical flora and fauna of the rainforest surrounding Puerto Vallarta. The adrenaline mounts as one rides from treetop to treetop, hovering over the canopy of the lush vegetation of the Sierra Madre Mountains. The scenery and bird life is spectacular from this truly privileged vantage point. Mexican Fiesta: An introduction to popular Mexican culture for the entire family, Mexican fiestas are held weekly in various hotels and restaurants in Puerto Vallarta with fun-filled activities for everyone including dancing, games and competitions accompanied by extensive buffets of traditional Mexican food and drink specialties. Swimming with Dolphins in the Wild: Visit with dolphins in their natural environment and participate in a research project that helps understand and protect dolphins. Interact with a Bottle-nose pod with professional biologists who will share their knowledge while they guide you on this once-in-a-lifetime experience. Bring your four-legged friend on vacation: One of the great joys of traveling is sharing the experience with loved ones -- including pets. Visiting Puerto Vallarta with Buddy, Bella or Shadow is made easy with the destination’s pet friendly hotels, sites and US-Mexico relations when it comes to pets traveling between the two countries. Whether traveling with a pet for companionship, service or comfort, pet owners and their four-legged companions will find that Puerto Vallarta offers a great diversity of offerings that make it easy to enjoy a visit to the destination. 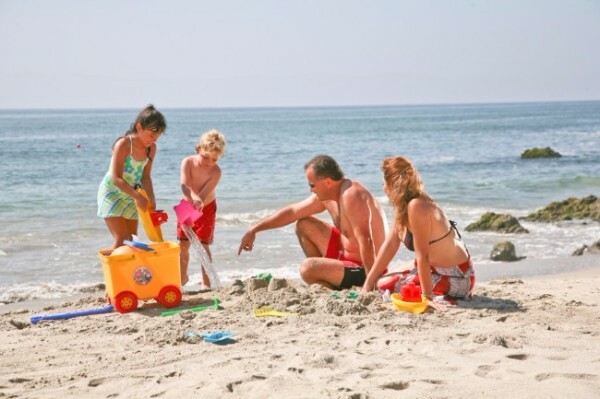 Fun at the Beach: What’s more fun than spending a day at the beach with the entire family? The Puerto Vallarta area offers 26 miles of beautiful beaches along picturesque Banderas Bay, set on the blue waters of the Pacific Ocean. Kids can enjoy playing on the sand, building sandcastles, playing ball, or throwing frisbees, or simply enjoy the clear waters of the ocean. Numerous other activities are also provided, including jet skiing and parasailing. Go on a treasure hunt with Pirates: Puerto Vallarta’s Pirate Ship is an all-day cruise featuring an exciting pirate show with acrobatics, sword fighting and cannons blasting. Activities for the whole family include dancing, games, contests, water sports like kayaking, banana boats, snorkeling, beach volleyball and buried treasure hunts. ATV Tours: For those boys and girls who looking for an outdoor adventure, exploring the back roads of Puerto Vallarta on an ATV (all-terrain vehicle) will prove a fun-filled experience. The tour takes riders to the rural countryside and along dirt roads and through rivers. It is recommended to bring old clothes and sneakers for this excursion as drivers end up completely covered in dust and mud. The tours are only open to children over 6 years old who have to ride with an adult holding a valid driver’s license. Horseback Riding: Exploring the lush vegetation on the jungle and mountain trails around Puerto Vallarta on horseback is a fun adventure for the entire family. Various ranches around town offer horseback riding tours. Typical routes take riders along rivers, waterfalls, canyons and picturesque mountaintop villages that offer spectacular views of the bay and the town of Puerto Vallarta below. Refreshing waterfalls allow for a well-deserved break where riders can go for a swim under cool cascades. Horseback rides are not recommended for children under 10 years of age. Taco Tour: Learn about Puerto Vallarta and Mexican culture with your palate. A taco tour in the morning is a fun way to learn about the Downtown or take an evening tour to start the night off. El Salado Mangrove Estuary: The Estero del Salado Lagoon is a heaven for wildlife enthusiasts; a beautiful expanse of white mangrove, palm trees, mosses, ferns, and fauna home to some 100 exotic species of colorful birds, crabs, iguanas, monkeys, fish and more. Depending on the season visitors can also participate in the estuary’s crocodile and turtle release programs. Learn Spanish: Take a summer class at one of the many language centers located in Puerto Vallarta to learn Spanish and about the local Mexican Culture. Additional information on Puerto Vallarta is available at Visit Puerto Vallarta.